Flapping in the Breeze | Tennessee Aircraft Services, Inc. Imagine preparing to land at an away from home airport when suddenly you realize you’re holding almost full right aileron just to keep the plane level. It takes a few seconds to realize what’s happening, but a quick look out the windows confirms the left flap is full down while the right is retracted. Fortunately, your ailerons are properly rigged, so they are capable of full deflection to offset the effects of asymmetric flap deployment. After landing safely, a calm assessment of the situation can be made. Certainly not an event that’s easy to train for, so we need to explore what can be done to prevent scary events like this. The control cables in our Cessnas are manufactured using stainless steel or galvanized steel cable. Each material has its own advantages and disadvantages. Stainless is more resistant to corrosion but wears faster due to internal friction between cable strands. This internal wear is difficult to detect during routine inspections. Galvanized steel cables wear better than stainless and are easier to inspect for corrosion problems. However, they don’t last long in corrosive environments. The most common inspection method is simple visual inspection. A next level up is to pull a cotton cloth along the cable which will snag on any broken outer strand. The most common area for damage is any area that bends around a pulley, so more attention should be focused there. Due to the stainless cable tendency to wear internally, the best way to inspect it is to relieve all tension, then slightly untwist it. Obviously, not a practical inspection to perform at every annual. FAA AC 43.13­1B change 1 chapter 7 section 8 paragraph 7­149 gives great detail for various cable inspection methods. FAA AC 43.13­1B change 1 chapter 7 section 8 paragraph 7­150 gives information on corrosion prevention and lubrication of control cables. It may not seem obvious at first thought, but these cables do need lubrication. As they bend around pulleys, the individual strands slide against each other. As this friction wears the strands, the resulting debris promotes even more wear. A secondary benefit of lubricants is that it helps flush out much of this damaging debris. In the real life version of the story we started with, a plane we’d never seen before taxied up to our hangar a few weeks ago with the left flap fully extended and the right fully retracted. The pilot calmly told the story of his approach and landing, which helped focus our search for the culprit to the left wing flap system. 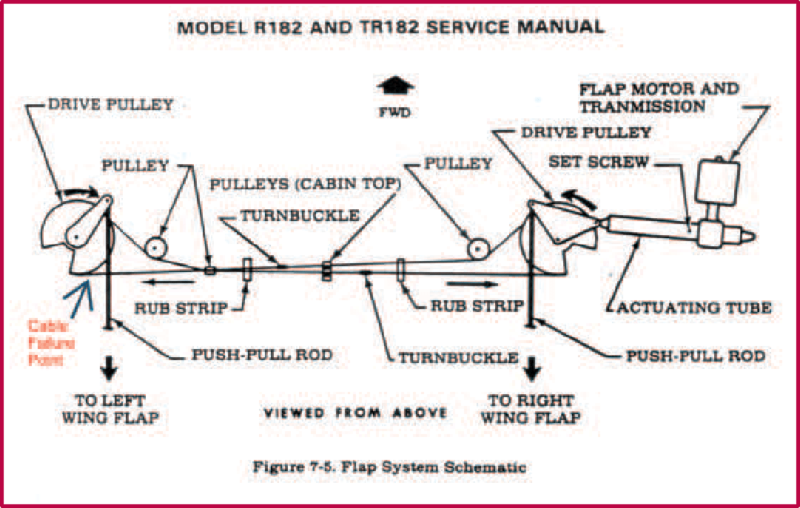 On the 182 series, the flap motor and transmission is mounted in the right wing and is directly connected to the right flap. The left flap is operated via cables from the actuator in the right wing. When we tested the system on the ground, a failed cable explained why the left flap would not operate at all, but the right flap operated normally. We opened a couple of panels under the left wing and, sure enough, one of the flap control cables had failed at the left bell crank. We could see evidence of corrosion on the cable as well as in the groove of the bellcrank where the cable rides. 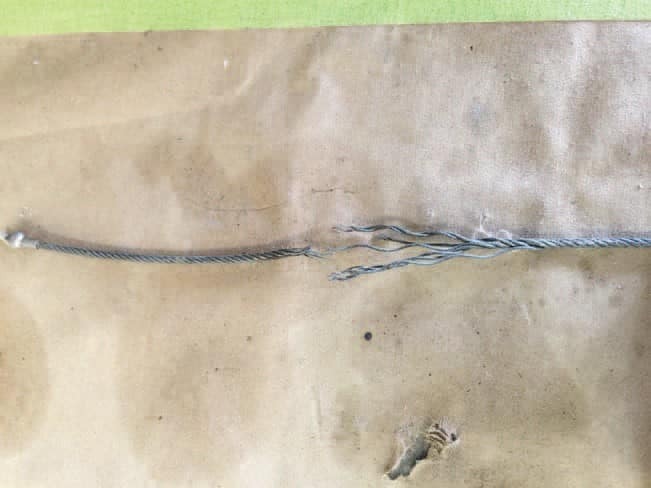 After inspection, the frayed cable ends revealed this was not a case of repetitive bending causing work hardened cable strands. We could see visible rust on the cable as well as in the groove of the bell crank. The failed ends of the flap cable out in the open. To find this during routine inspection is difficult and not something normally expected. As the cable wraps around the bell crank groove, it only bends around a curve with a four inch radius. It also only wraps and unwraps on this radius two or three times per flight. Compared to an aileron or elevator cable that wraps around a three inch diameter (1 1⁄2 inch radius) countless times per flight, the flap cables don’t see much action. The groove in this bell crank where the cable rides is situated in the wing in such a way that inspection can be difficult. A mirror or videoscope is required, as well as an intentional effort to see this spot. 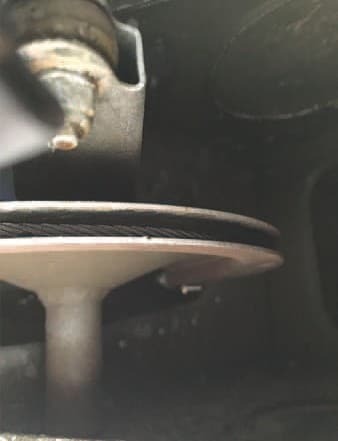 Even then, the corrosion is attacking where the cable contacts the bell crank groove, which may require the two to be separated for inspection. Operating the flaps to each extreme end of travel will expose almost all of the cable end and bell crank. If there is suspicion of problems at the very end, the cable would need to be removed. While installing the new cables and rigging the flap indicator cable, we discovered more trouble. The indicator cable was almost impossible to move. Pulling on it with our full body weight barely made it budge. In operation, this added stress must have increased the load on the system immensely. We attempted to pressure lube the sheathed cable from the top and the bottom. No improvement was found. The cable had no evidence of any recent lubrication. Close inspection of the remaining flap cables revealed various levels of aging, but none came close to the one that failed. As a precaution, the owner requested all new flap cables be installed. The financial cost amounted to five man hours labor plus over $500.00 for the four cables. Replacing the indicator cable is a separate job requiring more than a day and a lot of upholstery removal. Had the cables been inspected and lubricated routinely over the years, this scary in­-flight cable failure might have been avoided. In this case, the failure occurred in a very unlikely spot that seldom saw the light of day. No matter what we do, parts will eventually fail. The goal is to find the failure before it finds you. To do that, we all have to share what is found as these planes continue their natural path of aging.